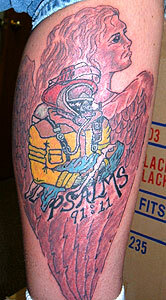 Sent in by the tattoo artist who is also a volunteer firefighter. Psalms 91:11 he ordered his angles to protect you wherever you go. This tattoo was done by a firefighter for a firefighter.